Since database file location is so important to I/O performance, you need to consider functional changes to tempdb when you create your primary data-file placement strategy. The reason for this is that tempdb performance has a rather large impact on system performance because it is the most dynamic database on the system and needs to be the quickest. As a result, placing the tempdb database on a dedicated and extremely fast I/O subsystem can ensure good performance. A great deal of work has been performed on tempdb internals to improve scalability. Consider reading BOL under “Capacity Planning for tempdb” for additional information and functionality details regarding tempdb usage. This can be found at: http://msdn.microsoft.com/en-us/library/ms345368.aspx. 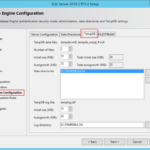 When you restart SQL Server, tempdb is the only database that returns to the original default size of 8MB or to the predefined size set by the administrator. It can then grow from there based on usage requirements. During the autogrow operation, threads can lock database resources during the database-growth operation, affecting server concurrency. To avoid timeouts, the autogrow operation should be set to a growth rate that is appropriate for your environment. In general, the growth rate should be set to a number that will allow the file to grow in less than 2 minutes. 1. Take into consideration the size of your existing tempdb. 3. Rebuild the index of your largest table online while monitoring tempdb. Don’t be surprised if this number turns out to be two times the table size because this process now takes place in tempdb. If any of these internal SQL Server objects or data stores run out of space, tempdb will run out of space and SQL Server will stop. For more information, please read the BOL article on tempdb disk space that can be found here: http://msdn.microsoft.com/en-us/library/ms176029.aspx. Pre-allocate space for tempdb files based on the results of your testing, but leave autogrow enabled in case tempdb runs out of space to prevent SQL Server from stopping. Per SQL Server instance, as a rule of thumb, create one tempdb data file per CPU or processor core, all equal in size up to a maximum of eight data files. Make sure tempdb is in simple recovery model, which enables space recovery. Set autogrow to a fixed size of approximately 10 percent of the initial size of tempdb. Place tempdb on a fast and dedicated I/O subsystem. SQLServer:Databases:Log File(s) Size(KB): Returns the cumulative size of all the log files in the database. SQLServer:Databases: Data File(s) Size(KB): Returns the cumulative size of all the data files in the database. SQLServer:Databases: Log File(s) Used (KB): Returns the cumulative used size of all log files in the database. A large active portion of the log in tempdb can be a warning sign that a long transaction is preventing log cleanup. Use instant database file initialization. If you are not running the SQL Server (MSSQLSERVER) Service account with admin privileges, make sure that the SE_MANAGE_VOLUME_NAME permission has been assigned to the service account. This feature can reduce a 15-minute file-initialization process to approximately 1 second for the same process. Hopefully this section has impressed upon you that in SQL Server 2012, more capacity planning is required to optimize tempdb for performance.